MSU opens spring practice just around the corner and many fans like myself are already jonesin for some football. Every team has position battles that rage on in the spring and MSU is no different. 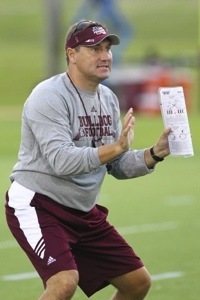 Ever since the arrival of Dan Mullen, he has preached competition as a vital means for the team to improve. Some positions have a battle for the starting nod while others have players fighting for reps. Lets look at some positions to keep our eye on this spring. QB- Nothing really to see here with Dak’s injury keeping him out. All Tyler Russell and his improvement. RB- You have to believe that LaDarius Perkins has the starting spot nailed down. That still leaves an intense battle for carries between sophomores Derrick Milton and Josh Robinson (we won’t see Nick Griffin due to injury). Although Robinson seems to be the fan favorite, anyone who has attended practices will tell you that Milton is the most natural runner of the bunch. The competition for #2 back will be heated. WR- After graduating 5 seniors this position is up for grabs. Robert Johnson and Joe Morrow will get their 1rst shot at starting positions. Also watch for juco early enrollee Jeremy Chappelle to challenge for starter. Jameon Lewis will get his chance to nail down the slot but we get to see if redshirt freshman Brandon Holloway can push him. Senior Ricco Sanders could be a wild card and redshirt freshman Fred Brown gets his first look. I know I’ll keep an eye on Micheal Carr since he has rejoined the team. TE- I think Malcolm Johnson solidifies his spot with Brandon Hill cementing his #2 TE spot. Rufus Warren and Gus Walley will battle for what’s left. Don’t forget Christian Holmes made a switch to TE. Curious to see him on offense. OL- I believe we are pretty set with Blaine Clausell, Justin Malone, Dillion Day, Gabe Jackson, and Charles Siddoway across the front. The battle here is for who comes off the bench. The guys I’m really watching to see progression are sophomore Devon Desper at center, junior Ben Beckwith at guard, and junior Archie Muniz at tackle. Damien Robinson has always been on the fringe and I’m really excited at getting a good look at sophomore tackle Justin Senior. DE- Gotta believe senior Denico Autry and junior Preston Smith gut out the starting spots. The battle behind them will be intense between sophomore Ryan Brown & sophomore John Harris. We also get our first looks at redshirt freshman AJ Jefferson and Torrey Dale. A lot of talent and competition here. DT- After the graduation of Josh Boyd and Dewayne Cherrington, these spots are wide open. Factor in new coach David Turner as well. It will be all out war between sophomores Quay Evans and Nick James and juniors PJ Jones, Curtis Virges, and Kaleb Eulls. Also get our first look at redshirt freshman Jordan Washington. LB- Return some experience here in Deonte Skinner, Benardrick McKinney, and Matt Wells. Senior Chris Hughes and junior Ferlando Bohanna will make a big push with their physicality. Many fans are very excited with redshirt freshmen Richie and Beniquez Brown. A sizeable portion of the fan-base think Richie can press for a starting spot. CB- All eyes will be on juco early enrollee Justin Cox, expecting him to cement 1 of the CB spots as expected. The battle for the other spot will be intense between junior Jamerson Love and redshirt freshman Cedric Jiles. Sophomore Taveze Calhoun has shown well and many are hoping redshirt freshman Will Redmond makes a big jump. They very well could be battling for reps in the DB heavy packages. S- Senior Nickoe Whitley will be 1 starter but his continued recovery will be watched closely. I expect junior Jay Hughes to grab the other spot. Junior Dee Arrington will challenge Jay Hughes to the limit for the other spot. Many are hoping sophomores Kendrick Market and Deonte Evans make a jump and push for time. We also get our first real look at redshirt freshman “Hitman” Quadry Antoine. This entry was posted in Sports and tagged Football, Hail State, MSU, Spring Practice. Bookmark the permalink.